Husband and wife artist duo Claude and François-Xavier Lalanne, known by their collective signature 'Les Lalannes' worked together from 1956 until François' death in 2008. Their first sculpture exhibition took place at the Galerie J. in Paris in 1964, where they presented a series of whimsical and surreal sculptures: a life size rhino that folded into a desk, a watch hidden inside an onion and a cabbage resting on chicken's feet. From this they were take on by Alexandre Iolas, who championed the french Surrealists of the time. Here they remained until 1979 when Iolas died and the gallery closed. The couple then moved from their studio at the Impasse Ronsin, where their studio backed ont Brancusi's, to a rural idyl, in Ury, and hour outside Paris. There they continued to work on their whimsical sculpture. François Xavier was known for his oversized beasts, Claude is for her intricate organic forms. 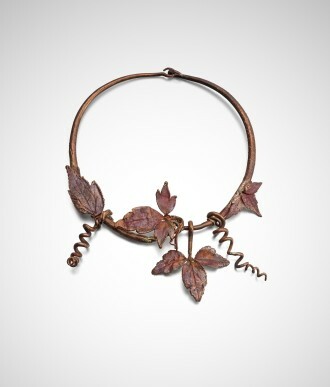 Though Francois did turn his hand to the occasional piece of jewellery, of the two it is Claude who has used jewellery as a medium for artistic expression throughout her career. The success of both Claude's sculpture and jewellery is in part due to her mastery of electroplating, a process which allows the complete transformation of organic material into copper, using a bath of copper sulphate with a current running through it. When the flora or fauna is submerged, the copper builds on the organic material, ultimately creating a perfect metallic replica of the original. From these the artist sews together this fosillised forms, giving them new life as fantastical creatires, furniture and jewellery.